Polyurethane coatings offer excellent optical properties, such as high gloss and brilliance. Polyurethanes (PUR) are reaction products of polyisocyanate curing agents with several polymers, e.g. with polycarbonates. Polyurethane-based two-component coatings are very solid, offer good resistance to aggressive chemicals, weathering, and mechanical stress. Ceresana examined the global market for PUR paints and coatings in detail: The market research institute forecasts revenues generated with these products to rise to approx. USD 20.3 billion until 2025. 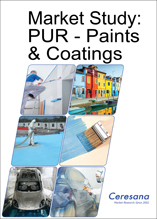 The most important application areas for PUR paints and coatings are furniture and wood processing, transportation, and other industries. In 2017, approx. 53% of global demand was registered in Asia-Pacific, followed by North America and Western Europe. The most important sales market for PUR paints and coatings in 2017 was the segment wood processing/furniture with a share of 37.0% of total global demand. Color, structure, and pore formation of the wood are properties, which should be retained or reinforced during coating. Two-component PUR systems are highly reactive, can be sanded quickly, are resistant to household chemicals, have a good filling power, improve grain contrasts, and provide mechanical stability. Chapter 3 analyzes the regional markets for paints and coatings: Data and factors influencing demand in the segments transportation (OEM, refinish), construction, wood processing/furniture, industry, and others.